Large, filter-feeding whales have long been thought of as indiscriminate grazers that gradually consume copious amounts of tiny krill throughout the day - regardless of how prey is distributed in the ocean. 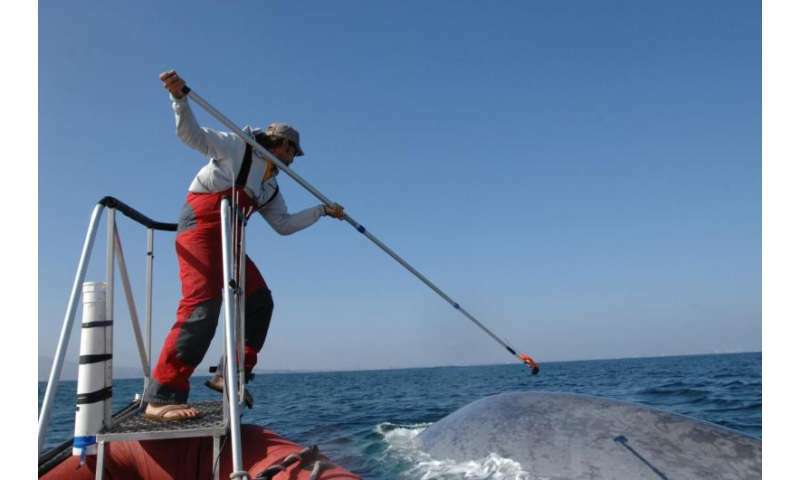 But tagged blue whales in the new study revealed sophisticated foraging behavior that targets the densest, highest-quality pretty, maximizing their energy gain. 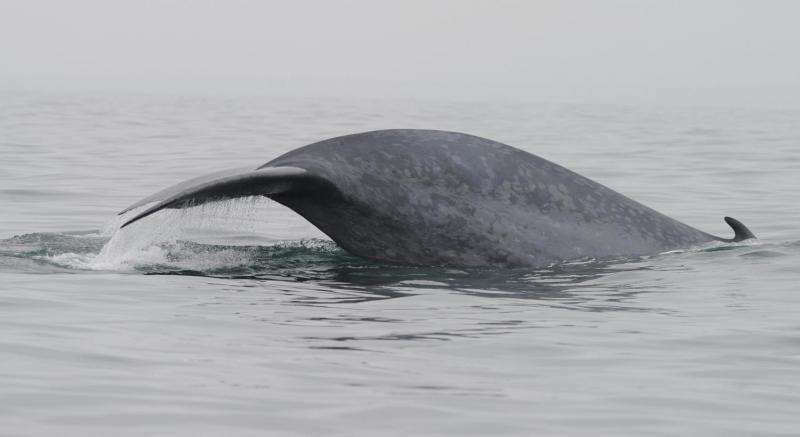 "For blue whales, one of our main questions has been: How do they eat efficiently to support that massive body size," said Elliott Hazen, a research ecologist with NOAA Fisheries' Southwest Fisheries Science Center and lead author of the research. "Now we know that optimizing their feeding behavior is another specialization that makes the most of the food available." Adult blue whales can grow to the length of a basketball court and weigh as much as 25 large elephants combined, but they operate on an "energetic knife-edge," the researchers point out. They feed through the extreme mechanism of engulfing as much prey-laden water as they weigh and then filtering out the tiny krill it contains. 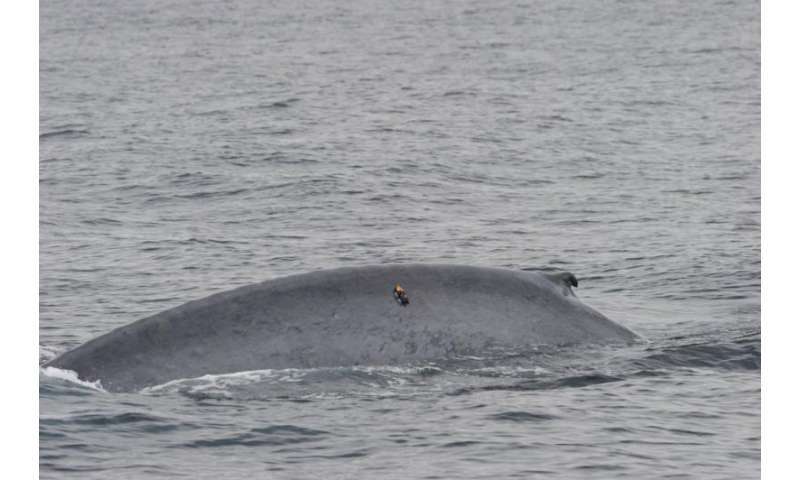 In their study, the researchers compared the foraging of 14 tagged blue whales to 41 previously tagged blue whales off the coast of California, combining the data with acoustic surveys that measured the density of their sole prey, krill - tiny (less than one inch) crustaceans found throughout the world's oceans. The researchers found that when the krill were spread out, or less dense, blue whales fed infrequently to conserve their oxygen and energy use for future dives. When krill density increased, they began "lunge-feeding" more frequently, consuming more per dive to obtain as much energy from the krill as possible. "Blue whales don't live in a world of excess and the decisions these animals make are critical to their survival," said Ari Friedlaender, a principal investigator with the Marine Mammal Institute at Oregon State University's Hatfield Marine Science Center and co-author on the study. "If you stick your hand into a full bag of pretzels, you're likely to grab more than if you put your hand into a bag that only had a few pretzels." The feeding pattern that focuses more effort on the densest krill patches provides a new example of blue whale foraging specializations that support the animals' tremendous size. This kind of lunge-feeding takes a lot more effort, but "the increase in the amount of energy they get from increased krill consumption more than makes up for it," noted Jeremy Goldbogen, a marine biologist from Stanford University and co-author on the study. "Lunge-feeding is a unique form of 'ram-feeding' that involves acceleration to high speed and the engulfment of large volumes of prey-laden water, which they filter," Goldbogen noted. "But we now know they don't take in that water indiscriminately. They have a strategy that aims to focus feeding effort on the densest, highest-quality krill patches." "The magic number for krill seems to be about 100 to 200 individuals in a cubic meter of water," Hazen said. "If it's below that range, blue whales use a strategy to conserve oxygen and feed less frequently. If it's above that, they'll feed at very high rates and invest more effort." "If they are disturbed during the intense, deep-water feeding, it may not have consequences today, or this week, but it could over a period of months," Friedlaender said. "There can be impacts on their overall health, as well as on their fitness and viability for reproduction."